strategies for disposal, which should be used as a last resort. For more information on Avoidance and Minimisation, Reuse, Recycling, Recovery and Disposal, click on the relevant link in the drop down menu. Who Uses The Waste Hierarchy? The Environmental Protection Acts of most Australian States enshrine the Waste Hierarchy as a core principle and the UK Environment Agency supports the Waste Hierarchy as a general guide to selecting the best option for dealing with waste. However, despite the fact that it is widely used through out the developed world, some commentators have begun to question how effectively the Waste Hierarchy is actually implemented. For instance, in Australia implementation of the hierarchy has been patchy, with most effort to date focussed on recycling and composting (Gertsakis and Lewis, 2003). 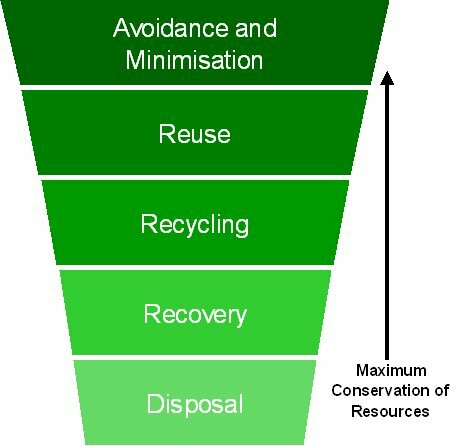 J Gertsakis and H Lewis, 2003, Sustainability and the Waste Management Hierarchy: a discussion paper for EcoRecycle Victoria, RMIT, Melbourne.